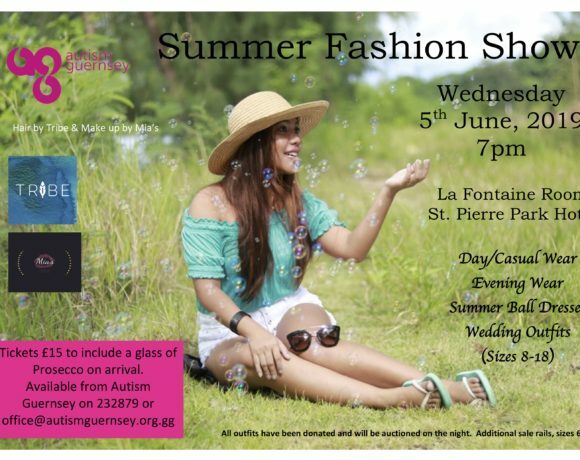 Autism Guernsey is delighted to be hosting their annual fashion show & auction at St. Pierre Park on 5th June. 32 donated outfits will be modelled in four themes – daywear/casual, evening wear, wedding outfits and summer ball dresses, sizes 8-18. The outfits will include shoes, handbag, costume jewellery, cardigan/jacket/pashmina and hat/fascinator if appropriate. The outfits will then be auctioned at the end of the night – so a great time to grab yourself a fantastic bargain. There will also be rails of additional clothes in sizes 6-22, shoes and handbags for sale on the night. There will also be a fantastic raffle with lots of lovely prizes. If you would like to purchase a ticket please contact Mandy on 232879 or [email protected] Tickets cost £15 to include a glass of Prosecco or orange juice.